Double Your iPhone Battery Life! Mili launched the Power Skin for iPhones doubling your iPhone battery life. It's the world's thinnest external battery and protective case for iPhone 3G and 3GS. The Power Skin comes with a 1,200 mAh battery capacity boosting your iPhone uptime. A pass-through USB/mini-USB for syncing and charging without removing the case and is designed to be easily removed for docking. What's eco about the Mili Power Skin? When the iPhone is connected to the MiLi Power Skin, the MiLi’s internal smart chip efficiently prioritizes power consumption. If the MiLi is being charged, the iPhone’s consumption comes first from the USB power source. When the MiLi is not being charged, the iPhone’s power consumption comes from the MiLi battery. The iPhone will continue to use the battery until the MiLi’s remaining charge is less than 5 percent. 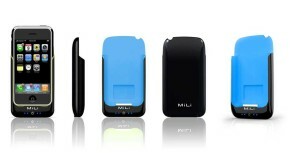 When the MiLi battery is less than 5% charged, the internal iPhone battery power source is used. The iPhone battery power source is always used last so it can maintain its maximum charge. A clear-cut example of smart tech :) Buy it here.